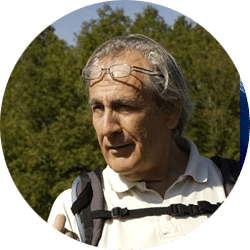 With over 30 years’ experience as a certified and licensed Regional Guide-Interpreter, Bruno accompanies English-speaking visitors on their journeys through southwestern France. Bruno was born and raised in the Dordogne area. In addition to his expertise and passion for prehistory and Middle Ages, he also has a deep love for the Romanesque sculpture and architecture of the Périgord. As such, he has taken on the long-term and deeply satisfying challenge of making a complete photographic inventory of the fine details of the Romanesque churches and chapels throughout the region. Bruno has also published many articles on all aspects of life in Southwest France for local English-speaking magazines.